It was 50 years ago tonight that Lieutenant Columbo, as portrayed by Peter Falk, first appeared on American television screens. As Radio Times’ David Brown reminds us, February 20, 1968, brought the premiere of an NBC made-for-TV-movie titled Prescription: Murder, an elegantly twisted mystery starring Falk, Gene Barry, Katherine Justice, and Nina Foch. Written by William Link and Richard Levinson, the story found a rumpled but shrewd Los Angeles police detective facing off against a wealthy and devious psychiatrist, Dr. Ray Flemming (Barry), who has murdered his wife, Carol (Foch), in order to preserve a relationship with his younger mistress, actress Joan Hudson (Justice), and seeks to conceal his role in that homicide. It takes Flemming most of the film to realize that he has underestimated his dogged pursuer. In the best scene, the two men discuss the murder in theoretical terms—though each knows exactly what happened. Flemming even offers a psychoanalysis of Columbo’s tactic of masking his intelligence. At its best, Prescription: Murder is a two-character play—and I mean that as a compliment. William Windom, Nina Foch, and Katherine Justice are fine in supporting roles, but the crux of the film is the cat-and-mouse game between Columbo and Flemming. Prescription: Murder wasn’t technically a pilot for Columbo, but as William Link recalls in the first of the two video clips found here, it was such a popular telefilm that NBC immediately wanted to turn it into a series, with 22 episodes a year. Falk balked at such a commitment, however, and as a result the idea went dormant. 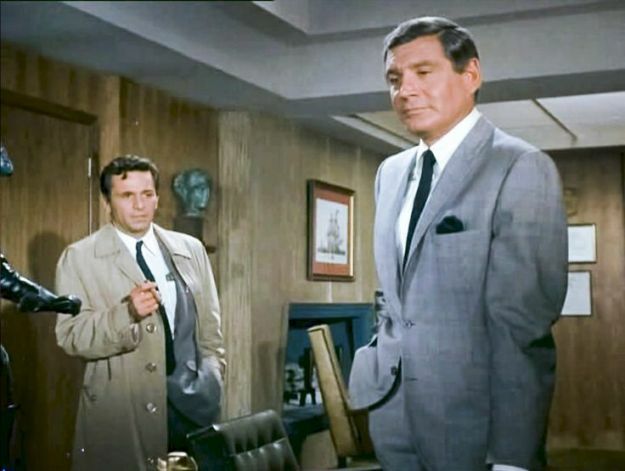 A few years later, Link and Levinson were asked to write the story for a second Columbo telefilm, which became Ransom for a Dead Man (1971), co-starring Lee Grant as “a brilliant lawyer who supposedly commits the perfect crime.” (Watch the opening from that flick here.) Like its predecessor, Ransom was a viewer-ratings winner, and the proposal to make Columbo a regular small-screen offering was revived—only this time the vision was to make it just one component of a rotating, or “wheel,” series of 90-minute dramas titled the NBC Mystery Movie. (Dennis Weaver’s McCloud and McMillan & Wife, starring Rock Hudson and Susan Saint James, were slated to become the other elements of that weekly rotation.) Being asked under this plan to shoot fewer episodes—only six or seven a year—Falk finally acquiesced. 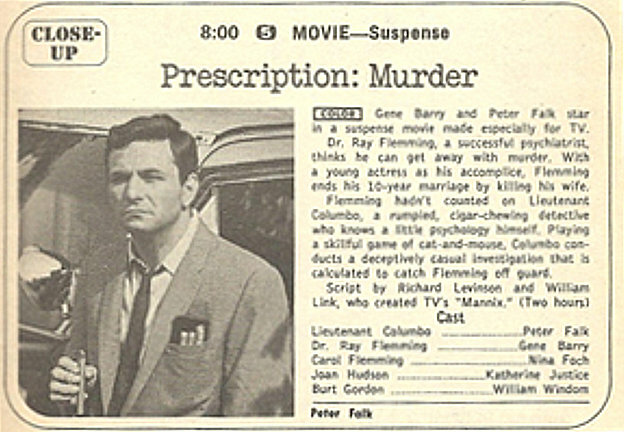 (Above) TV Guide’s 1968 “Close-Up” on Prescription: Murder. The rest, as that hoary cliché goes, is history. Columbo debuted beneath the NBC Mystery Movie umbrella on September 15, 1971, with an episode titled “Murder by the Book,” featuring Jack Cassidy as a renowned whodunit author bent on offing his writing partner, played by Martin Milner. Columbo would continue its run as part of the NBC Mystery Movie (later the NBC Sunday Mystery Movie) until the spring of 1978, and then be revived in a succession of two-hour films on a rival American TV network, ABC, broadcast from 1989 to 2003. Even 15 years after the airing of the final Columbo movie, Columbo Likes the Nightlife, the character Levinson and Link created, and that Falk inhabited so convincingly, hasn’t lost his appeal. There are currently whole Web sites devoted to that single-monikered L.A. cop (check out The Columbophile and The Ultimate Columbo Site! ), as well as a couple of podcasts (Just One More Thing and The Columbo Podcast—which addresses Prescription: Murder here) and at least two Twitter pages tied to those podcasts, Lieutenant Columbo and Just One More Thing. William Link’s The Columbo Collection (Crippen & Landru, 2010), comprising a dozen original short stories starring you-know-who, remains in print. DVD sets of both the original NBC series and the subsequent ABC films can be easily purchased. Episodes of Columbo continue to be shown on MeTV network and the Hallmark Movie Channel. And there’s even talk of a ColumboCon taking place in Falk’s old hometown of Ossining, New York, this coming July. And so we reach possibly the most famous aspect to Columbo: his “just one more thing” catchphrase, used to befuddle an antagonist just when they think a meeting is at an end. As Columbo makes to leave, out comes one of his seemingly inconsequential queries that end up putting the murderer further in the mire. Here is a man who doesn’t need to brandish a firearm (Columbo notably hated guns) or screech his car tyres—the dogged Lieutenant pulls the bad guys apart question by question. Who needs an action scene set-piece when you have Columbo wrapping up his dogged interrogations in fake apologies? So let’s share a toast to Lieutenant Columbo and Peter Falk, and also to William Link, who celebrated his 84th birthday this last December. (His childhood friend and screenwriting collaborator, Richard Levinson, died back in 1987.) While other crime solvers have flickered onto our TV sets, only to soon disappear and be forgotten, Columbo has achieved durable greatness. We can only hope his sly investigative talents will still be appreciated another half a century from now. READ MORE: “Columbo: An Origin Story” (The Columbophile). Thanks so much for this retrospective on a fine TV show and a great character. I really enjoyed all the stories that featured Columbo when the Sunday Mystery Series aired, and it was so nice to be reminded of what I liked so much about it. It was interesting to see that it is suggested that one aspect of Columbo's popularity was that the series indulged in Class Wars. Your quote from Radio Times referencing that he "reduced smug sophisticates to gibbering wrecks" made me smile. At the time the series aired, I did not consciously recognize that was the appeal for me, but I can see it now. I have considerable disdain for smug sophisticates and all the political games they play.